Cloudy skies. Slight chance of a rain shower. Low near 40F. Winds W at 5 to 10 mph..
Cloudy skies. Slight chance of a rain shower. Low near 40F. Winds W at 5 to 10 mph. Stories appearing in our World pages originate from aggregated news feeds obtained from various subscription news sources. Democratic California Sen. Kamala Harris announced on Monday that she is entering the 2020 race for president. Since being elected to replace fellow longtime Democratic Sen. Barbara Boxer, Harris’s record related to the Jewish community and Israel—from the 2015 Iran nuclear deal to anti-Israel bias at the United Nations—has largely reflected the mainstream positions of the Democratic Party. Harris, who represents the second-most populous Jewish state in the United States, voted against the nomination of David Friedman in March 2017 to be U.S. ambassador to Israel. Just days after voting against Friedman’s nomination, Harris addressed the annual American Israel Public Affairs Committee Policy Conference, where she talked about growing up in the Bay Area, where she collected donations for the Jewish National Fund. Additionally, Harris married her husband, Jewish lawyer Douglas Emhoff, in 2014 included the ceremonial smashing of the glass to remember the suffering the Jewish people have endured throughout history. At her AIPAC address in 2017, she stressed her support for a two-state solution to the Israeli-Palestinian conflict. Indeed, Harris was a co-sponsor of a Senate resolution to rebuke U.N. Security Council Resolution 2334. In April 2017, Harris signed onto a letter to U.N. Secretary General António Guterres, calling for the end of the world body’s animosity towards the Jewish state. 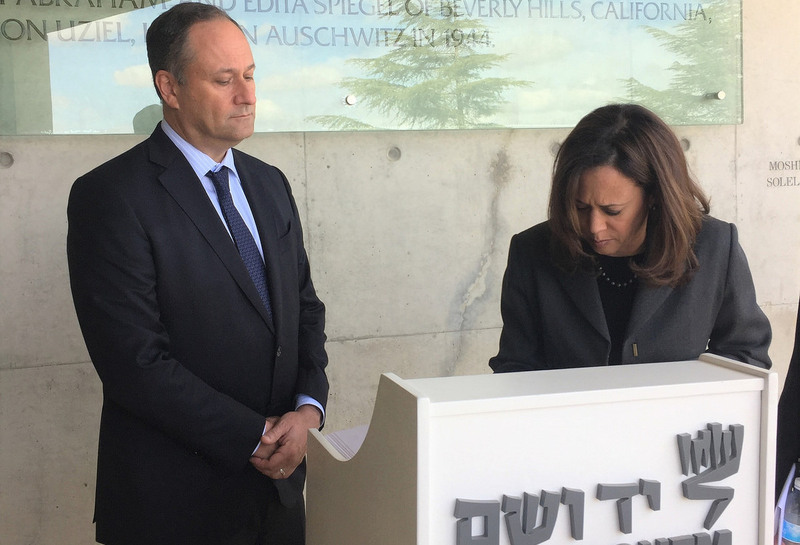 Sen. Kamala Harris (D-Calif.) in 2017 signing the guestbook at Yad Vashem as her husband, Doug Emhoff, looks on. Credit: Office of Sen. Kamala Harris. In late 2017, Harris traveled to Israel, where she met with Prime Minister Benjamin Netanyahu to discuss numerous issues regarding “deepening cooperation” between the United States and Israel. She also toured the country, including visiting its supreme court and the Yad Vashem Holocaust memorial and museum in Jerusalem. In the aftermath of the October 2018 shooting at the Tree of Life*Or L’Simcha Synagogue in Pittsburgh that killed 11 people, the deadliest attack in American Jewish history, Harris called for gun control. “It’s been 12 days since the mass shooting at Tree of Life Synagogue and a few hours since Thousand Oaks. No one should have to live in fear that their community will be the next one struck by gun violence. This isn’t normal. Congress’ inaction is costing lives,” she tweeted. Nonetheless, she has made combating hate crimes a top priority since serving as San Francisco District Attorney. She reported in 2012 that acts specifically targeting Jews were the most commonplace religion-related hate crime. Despite her legal credentials and growing political stature, Harris enters the presidential race with long odds in a crowded field, and it remains to be seen if her appeal can stretch beyond the progressive community.